According to the Central Brain Tumor Registry of the United States. An estimated 14,930 deaths will be attributed to primary malignant brain and central nervous system tumors in the United States in 2013. Total 40,000 deaths expected from breast cancer in 2014. National Cancer Institute reports a 5 year survival of 33.4% for brain cancer versus a 89.2% survival for breast cancer between the years 2004-2010. 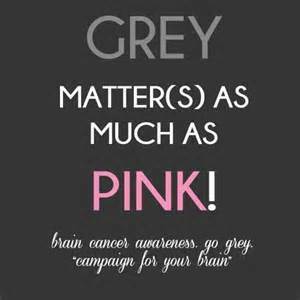 Brain cancer is responsible for 2.4% while breast cancer is responsible for 6.8% of all cancer deaths. second leading cause of cancer-related deaths in children (males and females) under age 20 (leukemia is the first). second leading cause of cancer-related deaths in males ages 20-39 (leukemia is the first). fifth leading cause of cancer-related deaths in females ages 20-39. 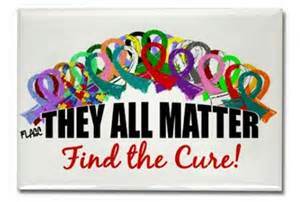 See the American Brain Tumor Association website for more information on brain tumors and brain cancer. Give the brain a thought. 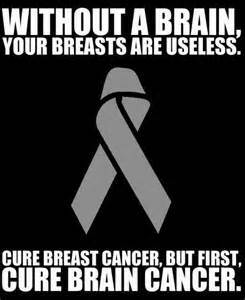 Yes, pink is important too but without a brain, breasts are useless!